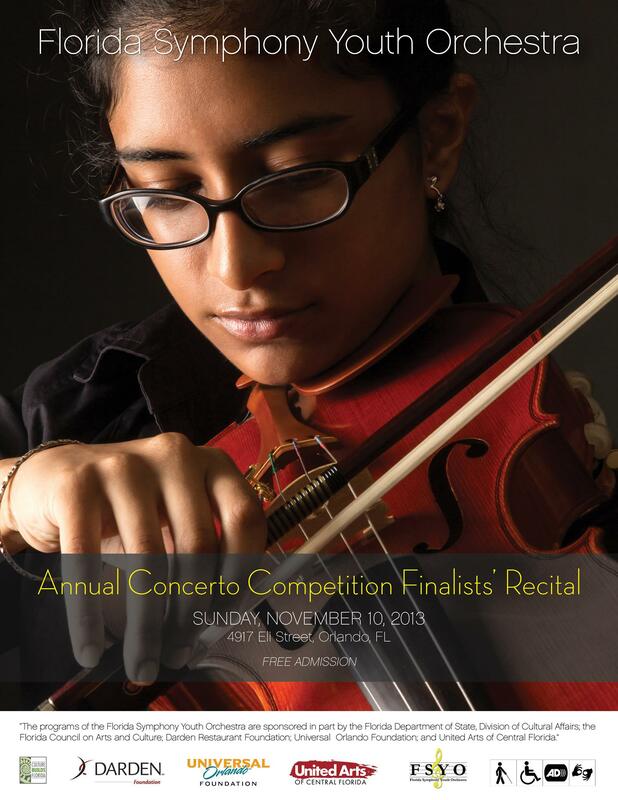 On Sunday November 10, the Florida Symphony Youth Orchestra will hold a recital showcasing the 2013-2014 Annual Concerto Competition Finalists. A highlight of the FSYO Concert Season, the Concerto Competition encourages students to step out of their roles within the orchestra, and into a soloist’s seat. The FSYO, which aims to educate and inspire Florida’s top young musicians through programs committed to strengthening musical talents and developing appreciation of the arts through classical music, comprises three full orchestras and one string training orchestra made up of 237 students from around Central Florida. In mid-October over 30 FSYO members came from all over the region to audition. Out of these, nine very talented performers were chosen as finalists. These nine talented young musicians will compete to win the honor of performing their concerto in a regular season concert accompanied by the FSYO’s Symphonic Orchestra, under the direction of Maestro Andrew Lane. Youth orchestras have played an important role in music education and fostering music appreciation in the United States throughout the twentieth century. The Portland Youth Philharmonic, which started in 1924, was the first independent youth orchestra established in the country. In the post-war years, young people’s concerts and youth orchestras gained prominence as a way of preserving and promoting the art of classical music when rock and roll emerged to dominate youth culture. The Florida Symphony Youth Orchestra was founded during this time when in 1957, Alphonse Carlo, concertmaster emeritus of the Florida Symphony Orchestra, recognized a need for a youth orchestra in Central Florida in which young musicians could develop their talents. The League of American Orchestras currently counts nearly 500 youth orchestras in the country, which involve more than 50,000 young musicians in the joy of music making and all the benefits that come with it. New orchestras are created each year to help meet the growing demand for music education and positive activities for young people. These orchestras encourage young people to develop their talents and to experience teamwork, self-discipline, and individual expression while refining musical skills they can use throughout their lives. Heidi Evans Waldron, the Executive Director of the Florida Symphony Youth Orchestra explains the benefit of participating in their concerto competition: “Each student is encouraged to demonstrate leadership by participating in the annual FSYO concerto competition. The ability to memorize music and play a leadership role within an orchestra prepares our students to easily transition into professional musicians. I enjoy watching these young musicians grow within the audition process and rise to the occasion on concert day.” Winners from previous seasons of the concerto competition have gone on to study at Juilliard, Manhattan School of Music, The Boston Conservatory, and many other prestigious institutions in Florida and around the country. Between scientific studies and success stories, there is plenty of evidence for the positive impact that studying music can have on young people and all of their future pursuits, whether or not they choose a career path in music. In addition to the Florida Symphony Youth Orchestra, the Florida Division of Cultural Affairs is a proud sponsor of some of our state’s other great independent youth orchestras, including the Tallahassee Youth Orchestra, the Greater Miami Youth Symphony, American Children’s Orchestras for Peace, and the All Florida Youth Orchestra along with a number of youth choirs and bands. While most youth orchestras operate at the local level, the National Youth Orchestra of the United States had their inaugural season in 2013, and they are currently inviting young musicians (ages 16-19) to audition for the 2014 season. Florida’s artistic and cultural heritage has greatly benefited from youth orchestras like the FSYO, which provide valuable life skills to the participating musicians and attract families to their surrounding communities. The FSYO Concerto Competition recital will feature works by Franz Joseph Haydn, Edward Elgar and Camille Saint-Saëns to name a few. The recital begins at 6:30 pm, Sunday, November 10, 2013, at St. Paul’s Presbyterian Church, 4917 Eli St., Orlando, FL 32804. For more information, visit fsyo.org. This entry was posted in Spotlight On and tagged Art Education, florida division of cultural affairs, Florida Symphony Youth Orchestra, FSYO, music, music education, Orlando, youth orchestras by culturebuildsflorida. Bookmark the permalink.